Spring in England is definitely not bringing with it the much craved sunshine but today I’ve put together a New Look Spring style to bring some brightness into your wardrobe, even when the sun isn’t yet shining outside. This look if fun and fresh to lift your spirits whilst remaining sophisticated and on trend. Yellow is a fantastic spring shade and this Yellow Waffle Textured Balloon Midi Skater Skirt adds a feminine, chic edge when teamed with clean, white Leather Ankle Strap Heels. 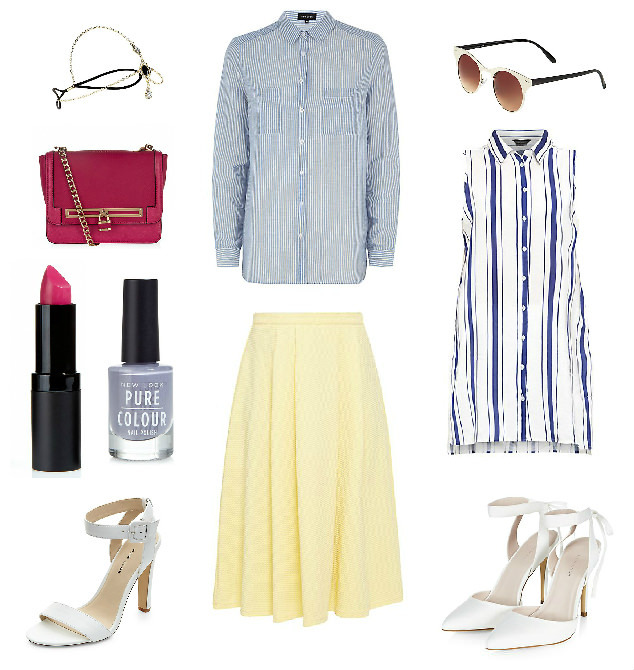 I paired these items with some essential spring stripes; New Look have some lovely subtle shirts available with a casual fit and slimming vertical lines. Add flashes of colour with your accessories and make up choices such as a pop of neon pink with the Bright Pink Chain Strap Shoulder Bag and Pure Colour Magenta Pink Matte Lipstick. Tie the look together with some elegant sunglasses. I love these white Black Metal Front Round Frame Sunglasses that mirror the white heels. The round sunglasses design is so popular this Spring 2015 but the slight cat eye frame makes them more wearable for myself. Add some subtle glam with an understated grey nail, the Pure Colour Light Grey Nail Polish has a slight blue tone that compliments the striped shirts. Finish off the look with a waved hair style and a Crystal Gem Drop Tikka Head Chain. Head chains are done well at New Look this spring and add some easy sparkle and grace to a spring look.